Mary Anne Richard and Joanne Krapf chose Pasco Kids First to be the beneficiary of their December Quarter Auction held at Trinity Meeting Center. 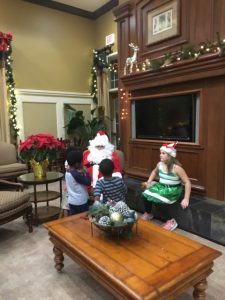 The event included several vendors who donated auction items as well as gave guests a chance to shop for those last minute holiday gifts and treats. The Law Office of Debora A. Diaz supported the event as the wine sponsor. Pasco Kids First board members, team members and community members donated gift cards for auction items and appetizers for the guests. The event included lots of fun, laughs and winners with the quarters a clinkin’ in the jars in the middle of the tables. The event raised $1,440.26 for Pasco Kids First supporting the organization’s mission to keep kids safe and strengthen families. 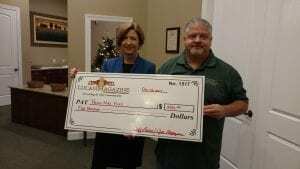 O’Brien’s Irish Pub and Restaurant in Wesley Chapel held a toy drive to benefit kids served by Pasco Kids First. The restaurant had boxes out for patrons to place their unwrapped dolls, games, stuffed animals and more. They also gave the donors a discount on their bill for contributing. The restaurant displayed poster boards of stories and testimonials from parents served by Pasco Kids First and distributed the organizations brochures. 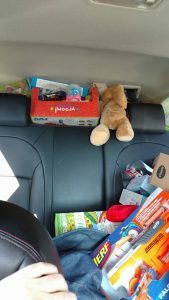 O’Brien’s then presented Jerri Hall, Resource Mom of the Pasco Kids First’s Healthy Families team with a car load of toys. 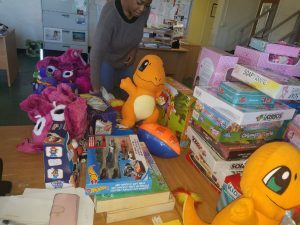 Check out photos below of the Healthy Families team members dividing up the gifts for the families. Thank you to Randy Goodwin, O’Brien’s Irish Pub and Restaurant General Manager, his team and their customers for their support in showing children and parents the gift of kindness from someone they never met! 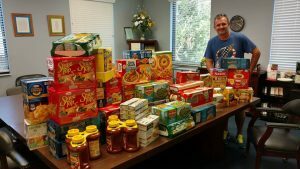 The Phi Delta Kappa Fraternity Past President, Shean Hylton and member Billy Sage, presented Pasco Kids First with a check donation of $519.84 and $500 in food items for families in need. They included several traditional favorites including potatoes, gravy, beef stew, vegetables, spaghetti and sauce. In addition, the children in the families loved the macaroni and cheese, peanut butter and chicken noodle soup. The Florida Alpha Lambda Chapter of Phi Delta Kappa is the only named Fraternity in the United States not associated with a College or University. The fraternity of 50 brothers of a variety of different occupations including teachers, law enforcement, business owners, doctors and contractors meet weekly at their PDK Banquet Hall on SR. 54 in Odessa. The rental of the facility support the day to day operations of the Facility and the local charitable endeavors of the Fraternity. 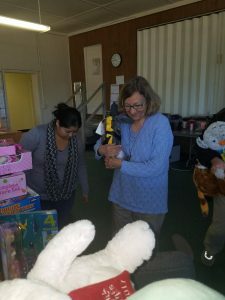 The Friends of D-10 Society held a toy drive house party to benefit kids in need served at the Pasco Kids First Children Advocacy Center and the Healthy Families Pasco-Hernando program. An unwrapped toy was the cost for entry into the party in South Tampa. 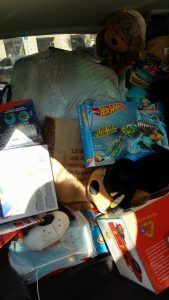 The toy drive has been coordinated by Heide Priess and Ray Rose for the past several years and grows each year. 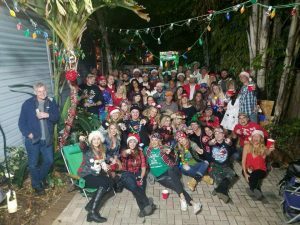 The guests dressed in a redneck theme with a Christmas flair and the house was decorated with lights, games, wrapped picture frames and provided free food and drinks. In the back yard, a huge home-made train was overflowing with gifts. 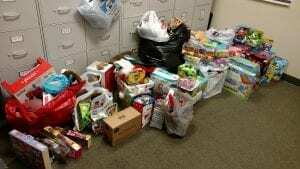 The group collected 151 gifts and $107 for Pasco Kids First! The Lucas Magazine Community Foundation presented Pasco Kids First with a $500.00 contribution toward the non-profit organization’s mission to keep kids safe and strengthen families. The Foundation was established in 2015 to support charitable and educational purposes including but not limited to helping individuals and organizations in the community, focusing on veterans, children, first-responders and single parents. Pasco Kids First has been serving kids and parents in Pasco County since 1989 and Hernando County since 2007 with services focusing on the prevention, assessment and treatment of child abuse and neglect. The 8th Annual Lauren’s Kids Walk in My Shoes will be coming to Pasco County on Tuesday, March 13th. The walk will start and end at Pasco Kids First Children’s Advocacy Center, located at 7344 Little Road in New Port Richey. The walk will be approximately 6 miles with a half way point at Pasco-Hernando State College. The walk is in honor of the 42 million survivors of child sexual abuse in the U.S. today. Registration starts at 3pm and the walk will begin at 4pm. Walkers can register for $15 at www.LaurensKids.org/Walk. You can join the Pasco Kids First team, create your own or register as an individual. Proceeds benefit Lauren’s Kids. Lauren’s Kids will be presenting Pasco Kids First with care kits to be distributed to kids and teens served by the Children’s Advocacy Center. The Kona Ice truck will be selling their famous shaved ice and have created a special teal blue Lauren’s Kids flavor for the event. They are also donating 20% of proceeds back to Lauren’s Kids. Pasco Kids First will also be giving tours of the Children’s Advocacy Center before, during and after the walk. Did you know? 1 in 3 girls and 1 in 5 boys will become a victim of sexual abuse before their 18th birthday…. BUT 95% of child sexual abuse is preventable through education and awareness. Together, we can prevent abuse, protect childhood and empower survivors. Come walk with us to raise awareness in your community and stand up against child sexual abuse. Lauren’s Kids Walk in my shoes is a walk from Tallahassee to Key West taking place from March 10th – 24th. The Bay Bridges Chapter of Bikers Against Child Abuse (BACA) will ride alongside walkers in their continued commitment to empower abused children to not feel afraid of the world in which they live. 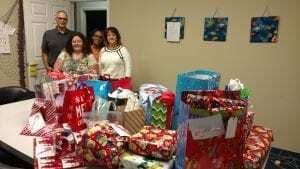 The Intrinsic Wellness Clinic in Wesley Chapel organized a Stock the Stuffing event at the Seven Oaks Clubhouse to support kids and teens served by Pasco Kids First. Cathy Di Leo organized the event on behalf of Dr. Todd Di Leo and the clinic to give back to the community. 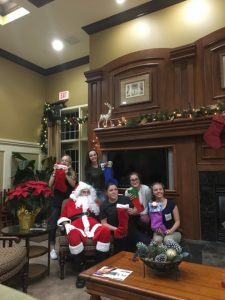 They recruited Executive Chef Peter Gambacorta with Private Chef of Tampa who donated the food and his time to provide guests with refreshments while they participated in holiday activities and visited with Santa. 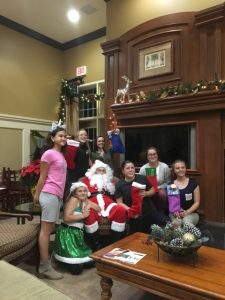 The admission for the event was to bring a new, fully stuffed stocking to a child that would otherwise not have a stocking this Christmas! The Di Leo’s collected 70 stockings and $175 donation which was presented to Pasco Kids First Healthy Families Resource Moms Lucy Shorts and Mayra Andrade. 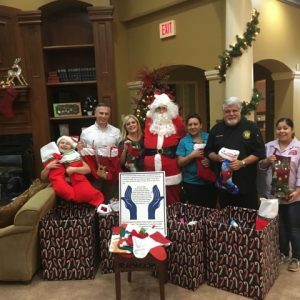 Pastor Freddy Santos, Rose Santos and Lesamarie Clary with Daily Transformation Ministries presented the Pasco Kids First Trauma Therapy Team Clinical Director, Kelly Plouffe, with toys and gift cards to assist with the wish list of 27 kids and teens receiving trauma therapy services. The Trauma Therapy Team provides victim advocacy and specialized therapy for child victims of trauma, sexual abuse and physical abuse. To learn more about Pasco Kids First Trauma Treatment Services, visit http://www.pascokidsfirst.org/pasco-kids-first-programs/trauma-treatment-program/. 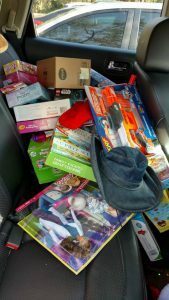 The Kienast Family sponsored a family with six children for Christmas. 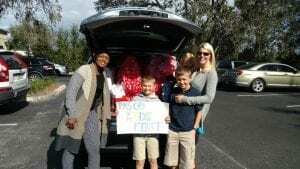 Penny Kienast and her children Carter, Cooper and Piper presented a car load of gifts to Pasco Kids First Trauma Therapist Carolyn Harris for the family. In addition, Cooper and Carter organized a gift card drive around their Estancia neighborhood in Wesley Chapel collecting $1,000 in gift cards for kids served by the Pasco Kids First Children’s Advocacy Center and Healthy Families Pasco-Hernando Program. 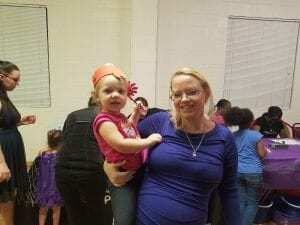 The Healthy Families Pasco-Hernando held an “Everybody’s Birthday Bash”” as part of their monthly Mommies, Daddies and me groups at the American Legion in Brooksville. 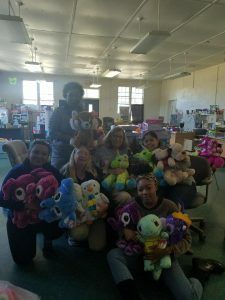 More than 75 people attended and ten agencies were represented providing families with treats, balloons and activities. 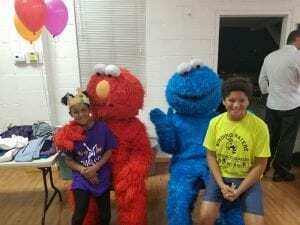 Kids even had a special visit from Elmo and Cookie Monster. 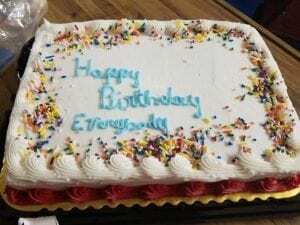 “It was like having a real birthday party. Games, crafts, characters, presents for everyone, cake, food, family friends, and even a cry baby. 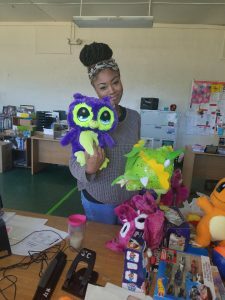 Fun, laughter, and love,” stated Healthy Families Hernando Supervisor Atiya Spellman. Healthy Families holds monthly Mommies, Daddies and Me Groups that are open to the public. Visit www.pascokidsfirst.org to see upcoming topics, date, location and time.